Of the many Pascal Obispo albums released over the course of the variété française giant's illustrious career, Welcome to the Magic World of Captain Samouraï Flower is perhaps the oddest and, among his studio efforts, the most trivial. It's a loosely tied together concept album in which he adopts the moniker Captain Samouraï Flower, dresses like a militarized Zorro, and sings fantastical songs with an idealistic ecological bent. The Beatles' Summer of Love opus Sgt. Pepper's Lonely Hearts Club Band (1967) is clearly an influence, in terms of costume as well as musical style. Like the Beatles, who were animated in the full-length cartoon film Yellow Submarine (1968), Captain Samouraï Flower was animated in the promotional videos for "Le Drapeau" and "Idéaliste" released prior to the album. These two album highlights are sequenced back to back after the two-minute introductory title track goes absolutely nowhere, in effect announcing that Welcome to the Magic World of Captain Samouraï Flower is indeed a concept album and more than a bit ridiculous. "Le Drapeau" is particularly curious in that it's a painfully obvious rewrite of Coldplay's international smash hit "Viva la Vida" from a year earlier; worse, even the videos are similar, with Captain Samouraï Flower dressed in the same pseudo-Sgt. Pepper's garb as Coldplay and striking the same poses (albeit animated) as Chris Martin. The similarity between "Le Drapeau," a Top Ten hit credited to Obispo and longtime songwriting partner Lionel Florence, and "Viva la Vida," also a Top Ten hit in France, is nearly criminal (the irony being that Coldplay were in fact sued for copyright infringement in December 2008 by American guitarist Joe Satriani, who accused them of plagiarism). 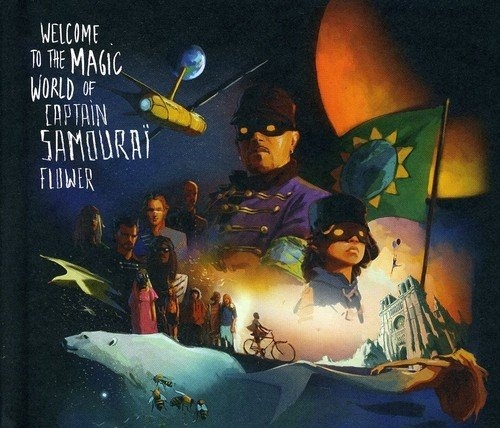 Elsewhere on Welcome to the Magic World of Captain Samouraï Flower, "I Give You My Love" quotes musically from George Harrison's Sgt. Pepper's contribution "Within You Without You" and yet another Beatles classic, "Eleanor Rigby." For someone known as one of France's top songwriters, it's a bit maddening to hear Obispo come up with so few original ideas on Welcome to the Magic World of Captain Samouraï Flower. While the album is not without merit, it pales in comparison to his peak period in the 1990s when he released classic albums like Superflu (1996) and wrote for Johnny Hallyday, Florent Pagny, and others.